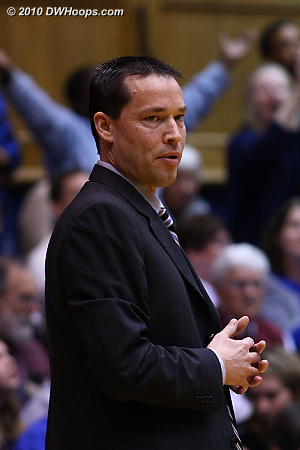 Are you a DWHoops member? 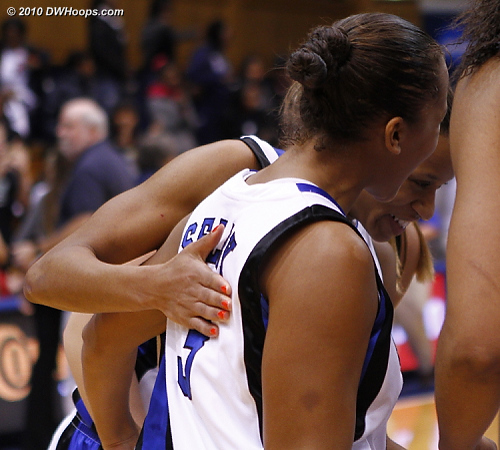 If so, you a) see more photos; b) see larger photos; c) support our work! 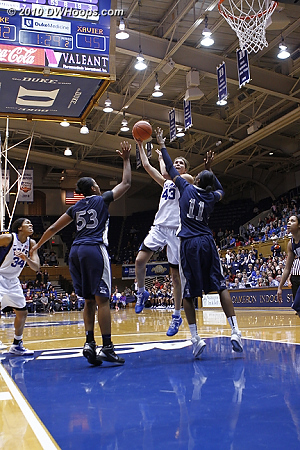 Please click the "Membership" button above for more info. 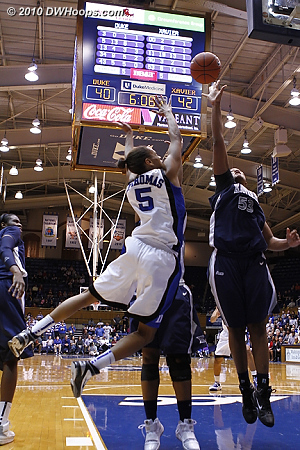 Jasmine Thomas got around Amber Harris, but missed the layup. 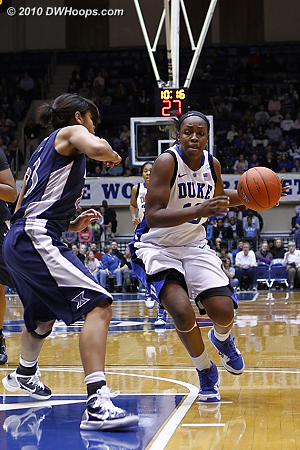 Karima's fast break layup made it a 5-2 Duke lead. 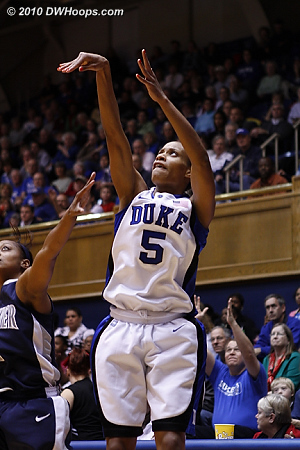 Jasmine hits a three to give Duke its largest lead of the night, 10-3. 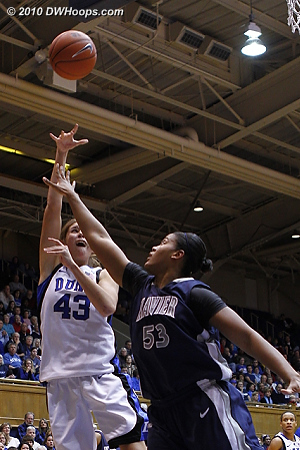 Allison Vernerey had a nose for the ball tonight; this was the first of her five steals. 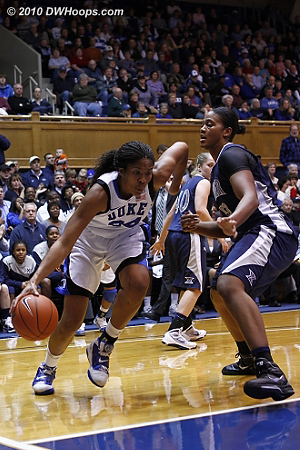 Jasmine Thomas shoots on a possession where Duke got good looks but came up empty. 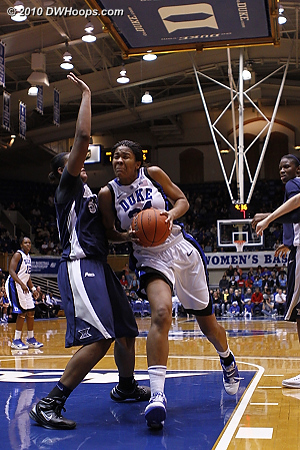 Amber Harris and Allison Vernerey battle on Duke's offensive glass. 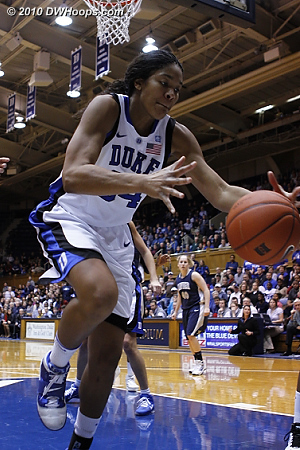 Chloe Wells drives towards the paint. 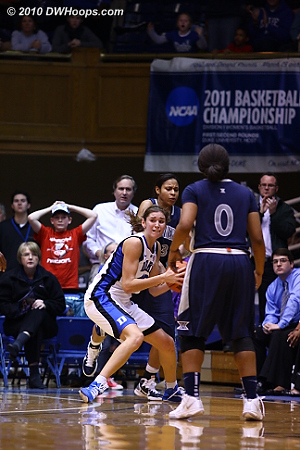 Allison looked concerned, but willed both free throw shots in. 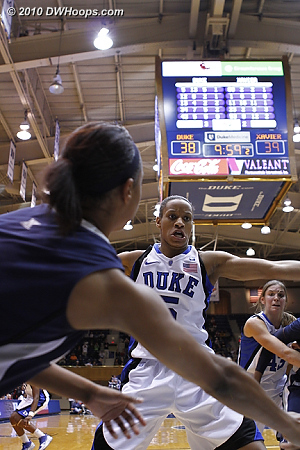 Duke leads 16-13. 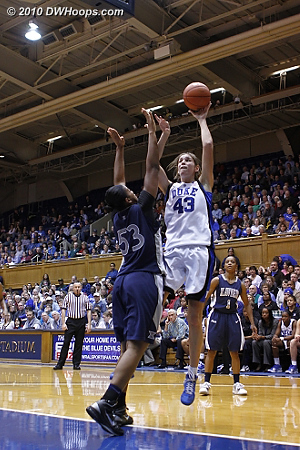 Haley Peters puts it on the floor as Ta'Shia Phillips closes in. 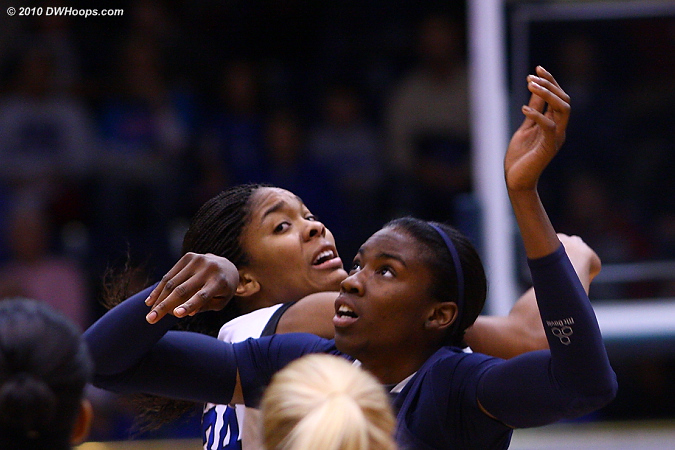 Krystal Thomas braces for contact, scoring the layup and drawing Ta'Shia Phillips first foul. 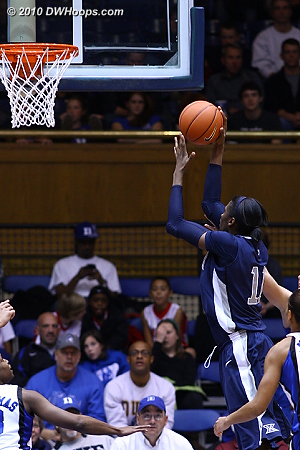 Krystal Thomas finishes a reverse layup, tying the score at 20. 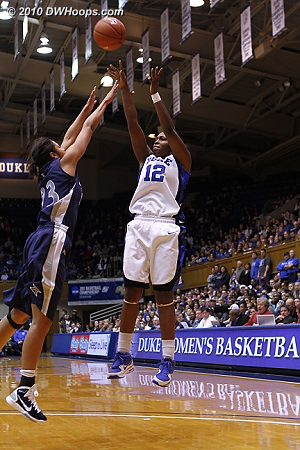 Krystal Thomas at the line, putting Duke up 21-20. 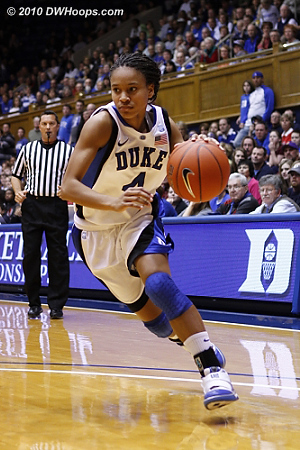 Chloe Wells made a fancy pass that was stolen away. 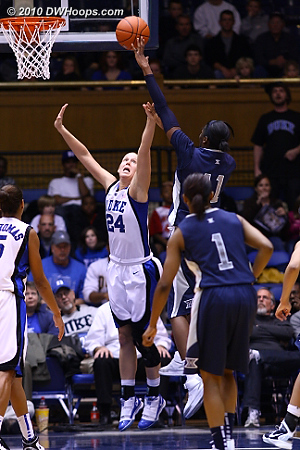 Scheer answers for Duke, 23-22 with under 6 minutes in the first. 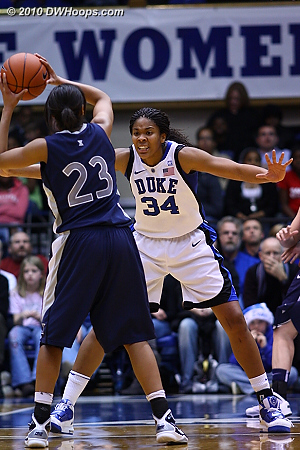 Krystal Thomas taking defense seriously. 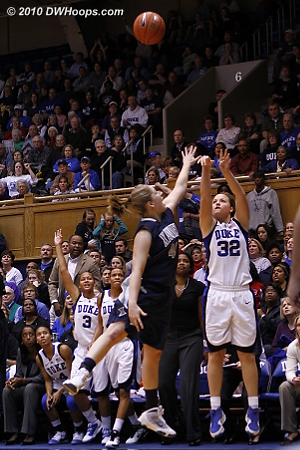 Scheer fires a three point miss -- Duke started 2-3 from behind the arc, then missed its last twelve treys. 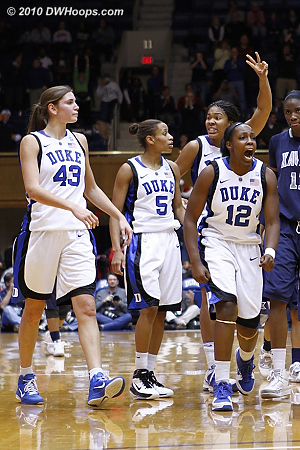 Amber Harris went down hard on her face and came up with a bloody nose. 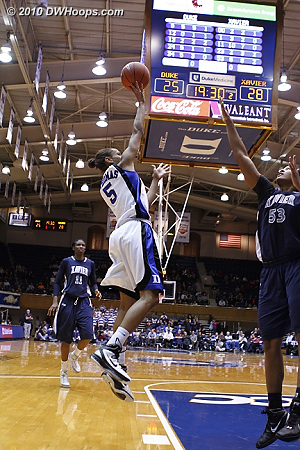 With Harris out for the time being, Xavier huddles. 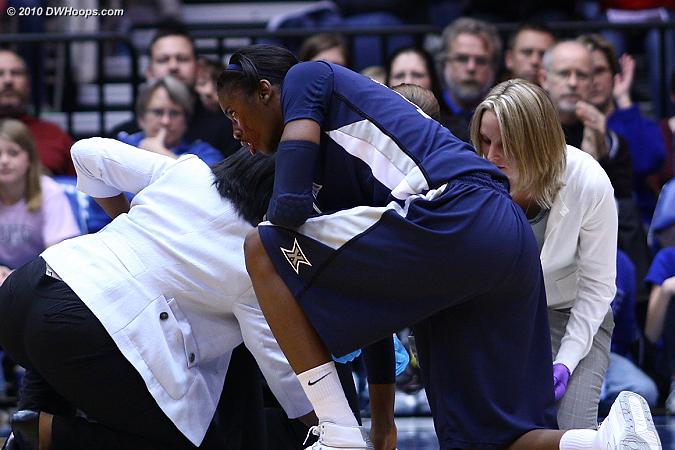 Harris came back quickly from the bloody nose to drain this jumper, Xavier up 26-25 with 1:40 left in the first. 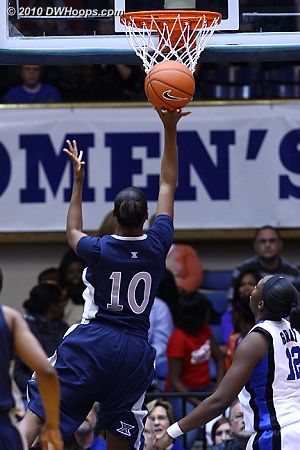 Lynette Holmes scores the last hoop of the first half, Xavier takes a 28-25 lead to the locker room. 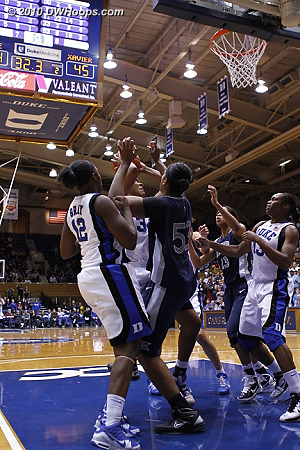 Chloe Wells gets a steal (uncredited) with 1.5 seconds left in the half. 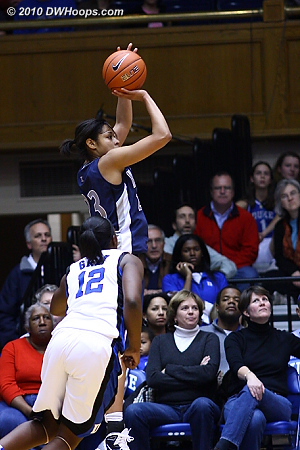 Jas started off the second half with a miss, but Krystal would eventually stick it back. 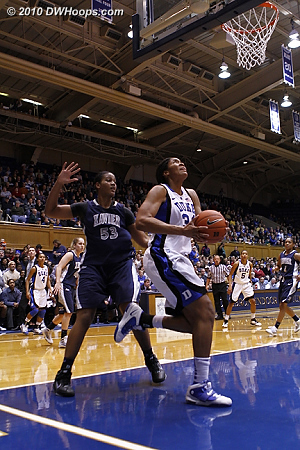 Krystal would be whistled for traveling. 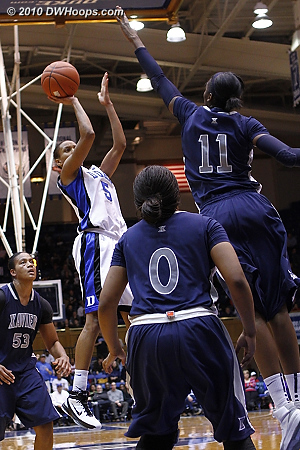 Another open jumper for Harris; Xavier goes up 34-27 and Duke needs a time out. 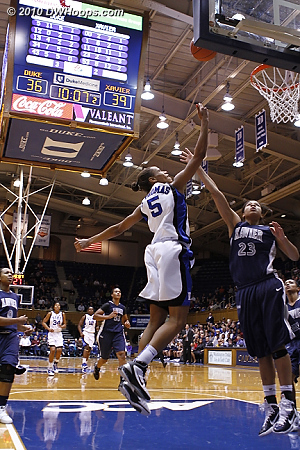 Karima Christmas can't sink this shot over Phillips. 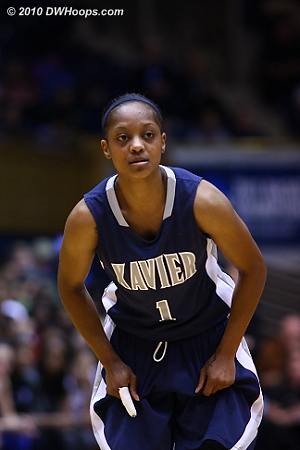 Special Jennings puts Xavier up 36-27 with 16:17 to play, the biggest Musketeer lead of the night. 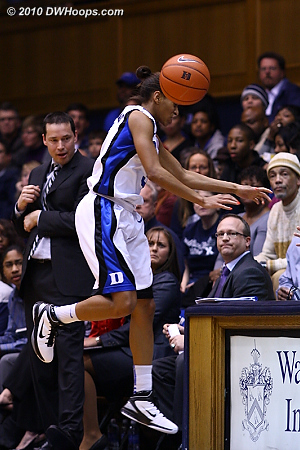 Allison gets one of many good looks that didn't fall - she was 1-9 from the floor. 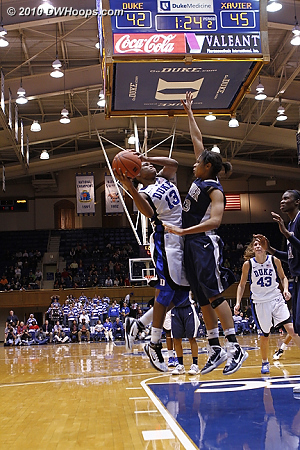 Haley Peters guards Amber Harris up top. 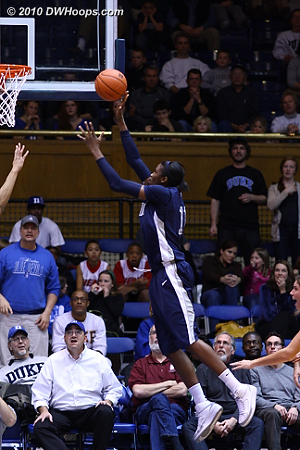 Jasmine gets things going with a jumper to cut the deficit to six. 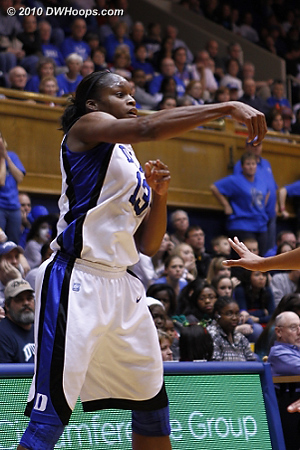 A loose ball just out of the reach of Krystal Thomas. 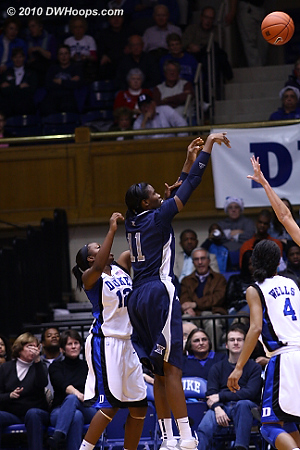 Shay comes up empty from long range. 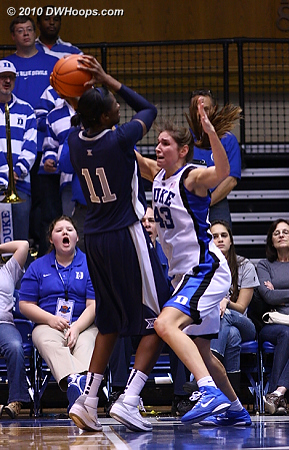 Allison draws a foul from Amber Harris. 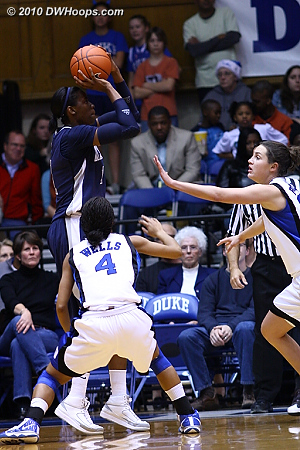 Karima makes a cross-court pass to Liston. 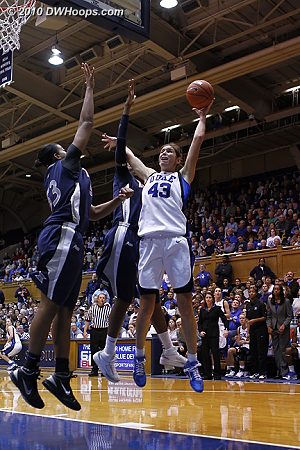 Tricia Liston's lone three point attempt was just off the mark. 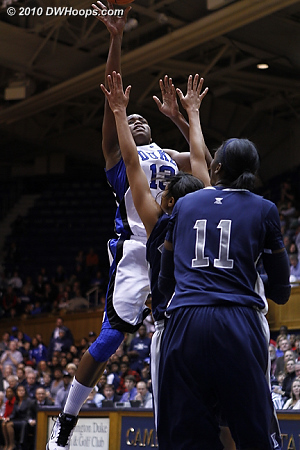 Amber Harris grabs a rebound. 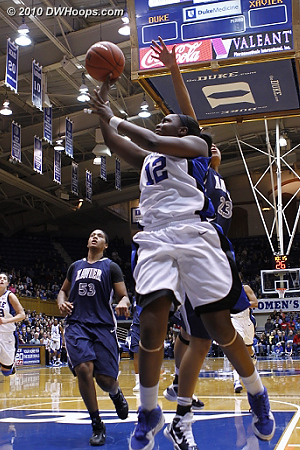 After Liston kept the Duke possession alive with her own board, Karima cuts the deficit to three. 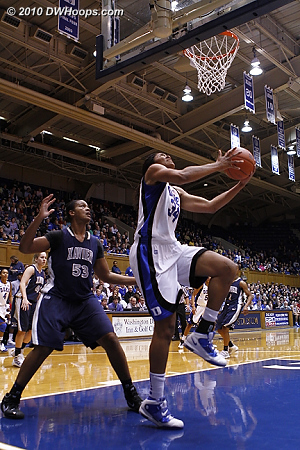 Jas is heating up with back-to-back hoops, Duke trails by just one. 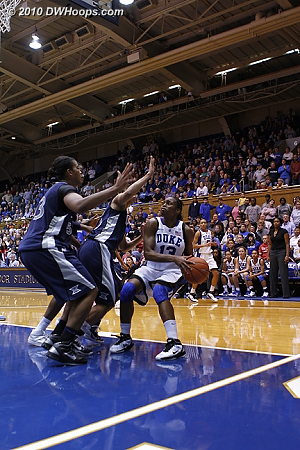 Jas and Allison intense in Duke's full court press off the made basket. 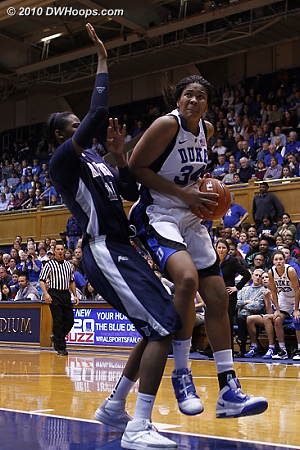 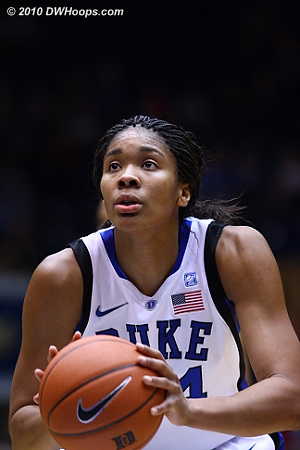 Krystal ties the game at 40 with a driving layup, but Duke would not score in the next six minutes. 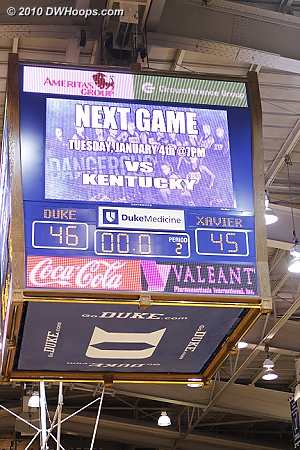 Harris puts Xavier up 42-40. 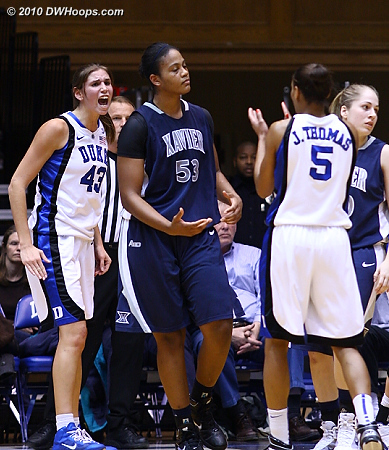 Vernerey excited after getting a steal and drawing a foul from Ta'Shia Phillips (53). 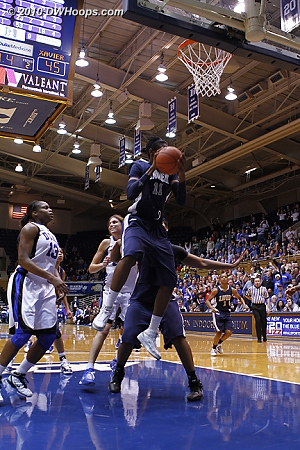 Phillips rebounds a J.Thomas miss. 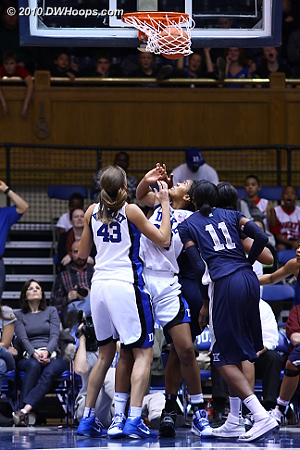 Karima Christmas on the line, her miss extended a then five minute Blue Devil scoring drought. 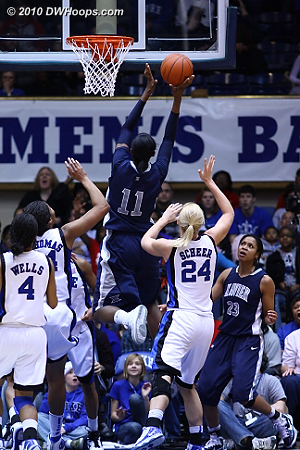 Amber Harris was whistled for an offensive foul before this shot. 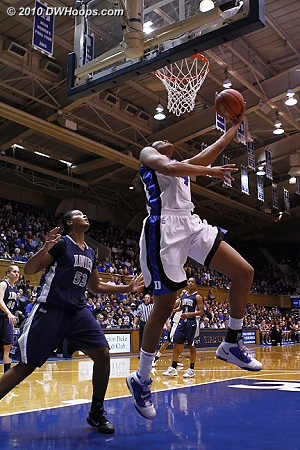 Jas starts the Duke comeback with a layup. 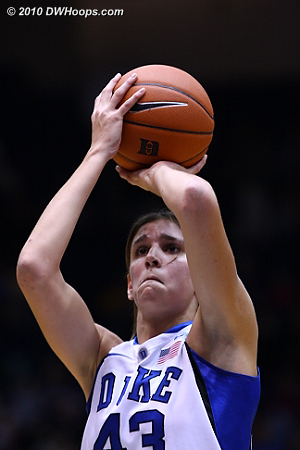 Vernerey attempts a hook from the free throw line but misses. 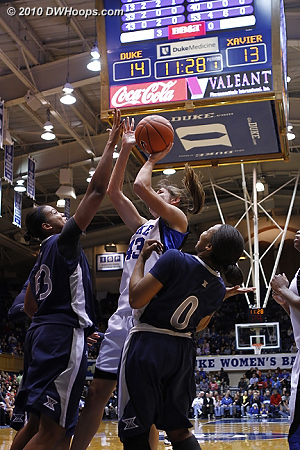 Christmas boards the Vernerey miss and somehow gets this shot to fall, Duke trails 45-44 with 1:22 to go. 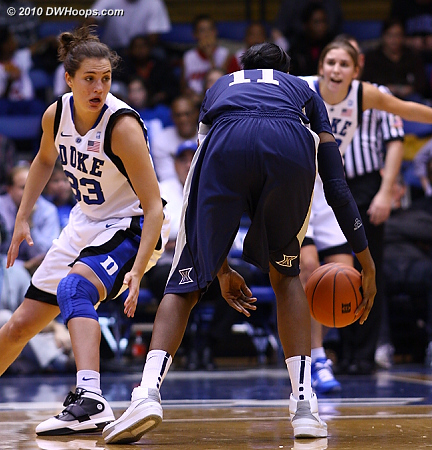 A key steal for Vernerey gives Duke the ball with 56 ticks left, down by one. 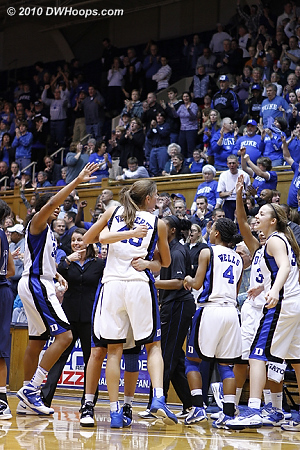 Allison Vernerey is embraced by Haley Peters in the joyous Duke huddle. 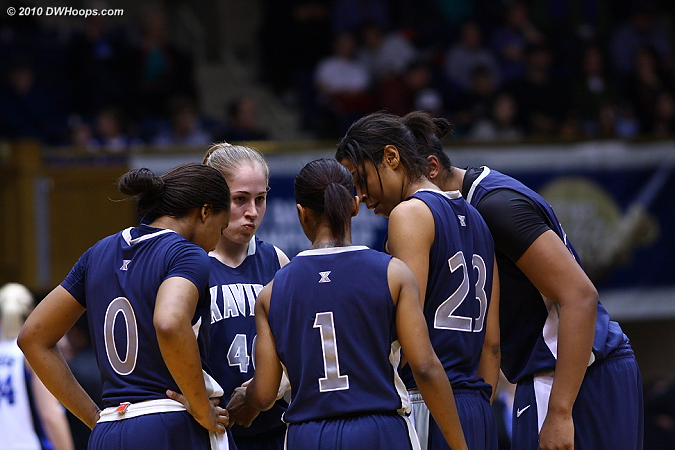 Karima Christmas meets the Xavier defense head-on. 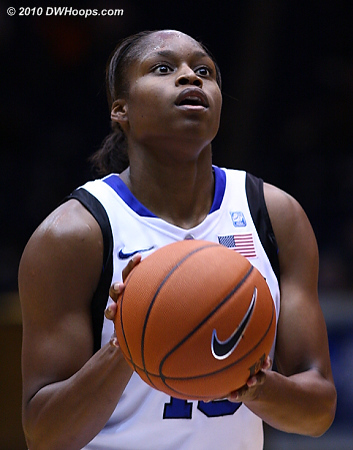 Krystal Thomas boards the Christmas miss and is hacked. 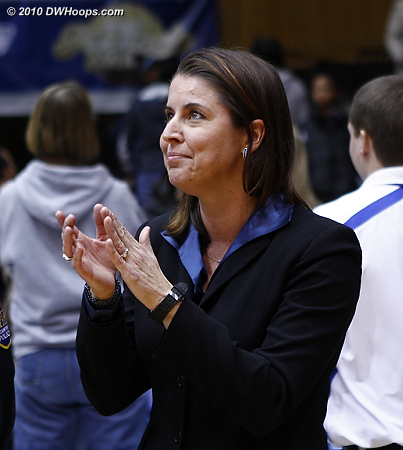 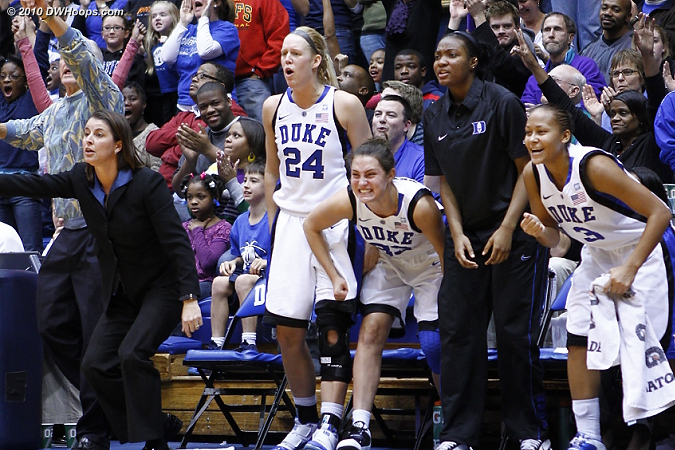 Duke bench reacts to Krystal Thomas game-tying free throw (including the injured Richa Jackson). 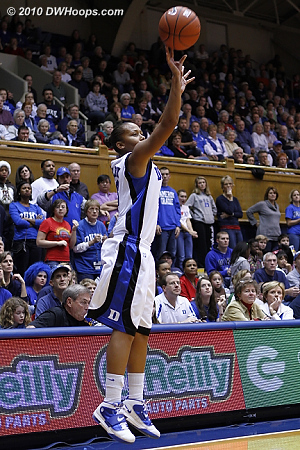 Krystal missed the second free throw, Amber Harris boarded the miss. 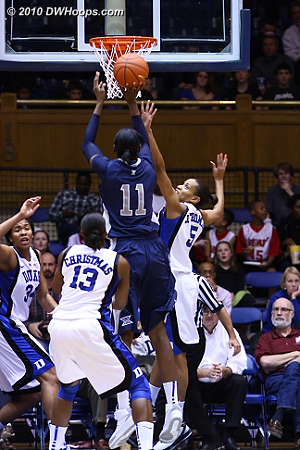 Karima Christmas pokes the ball away from Special Jennings with 3 seconds left and the game tied. 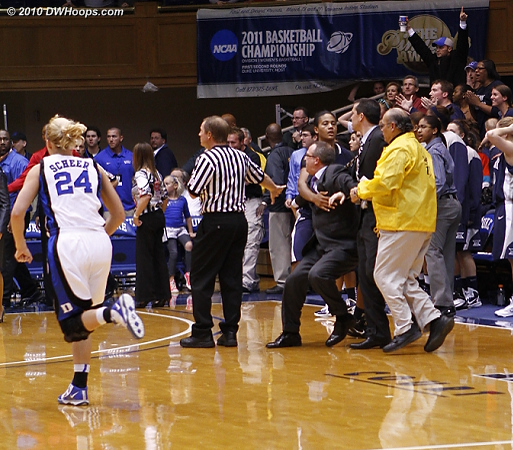 Duke celebrates Jasmine Thomas being sent to the line for two, with 2.5 seconds and the game tied. 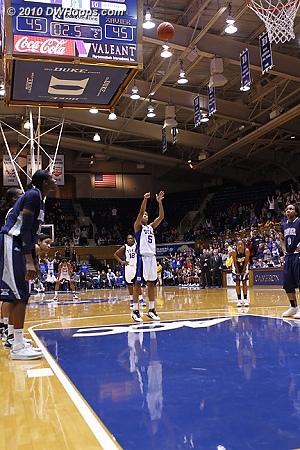 With the game tied and 2.5 seconds left, Jasmine Thomas awaits the first of two critical free throws. 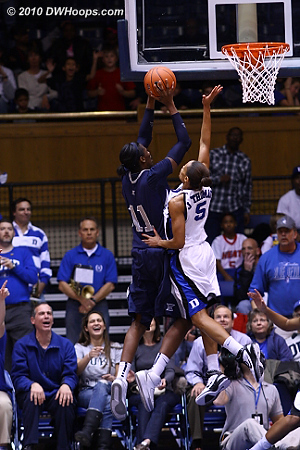 Free throw #1 is up... no good. 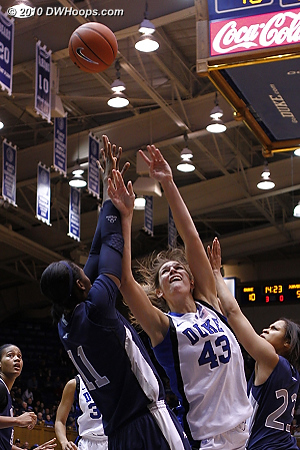 Free throw #2 falls through the net, Duke leads 46-45! 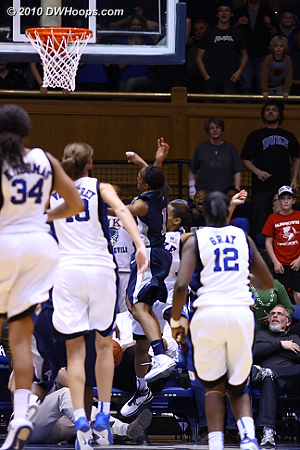 Jasmine Thomas came out of nowhere to block Special Jennings potential game winner - note that time has not yet expired. 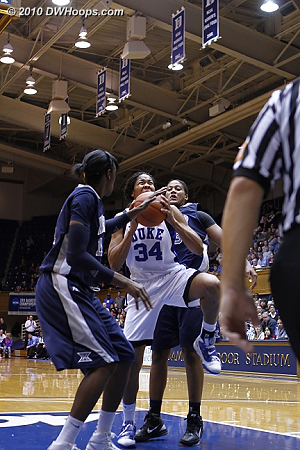 Ta'Shia Phillips restrains Xavier assistant Mike Neighbors, who wanted a foul called on Jasmine Thomas. 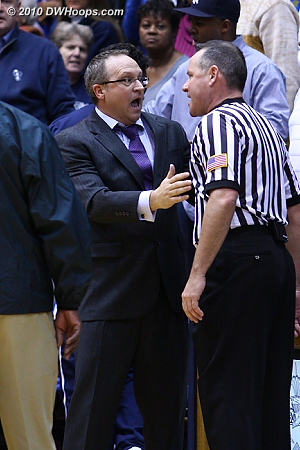 Xavier Assistant Mike Neighbors confronts one of the officials after time has expired. 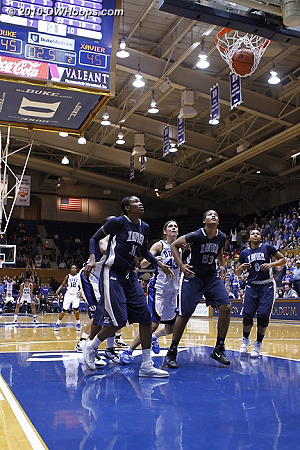 No time on the clock, the refs review the video screen. 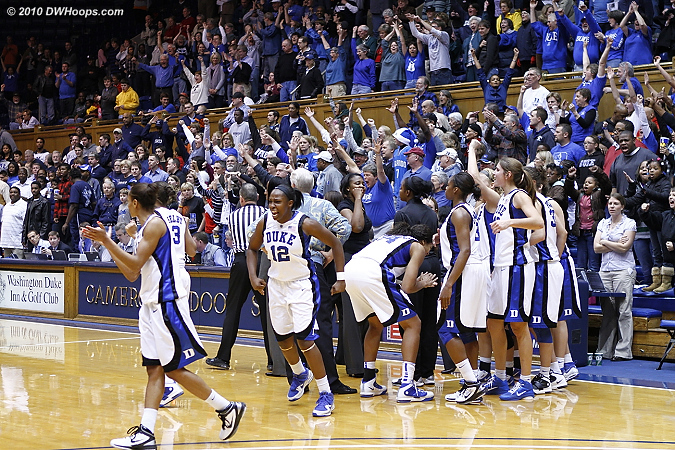 It's over, Duke wins 46-45. 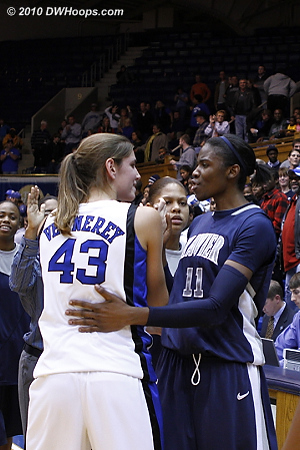 Allison Vernerey and Amber Harris meet in the handshake line; their battles in the paint were truly remarkable. 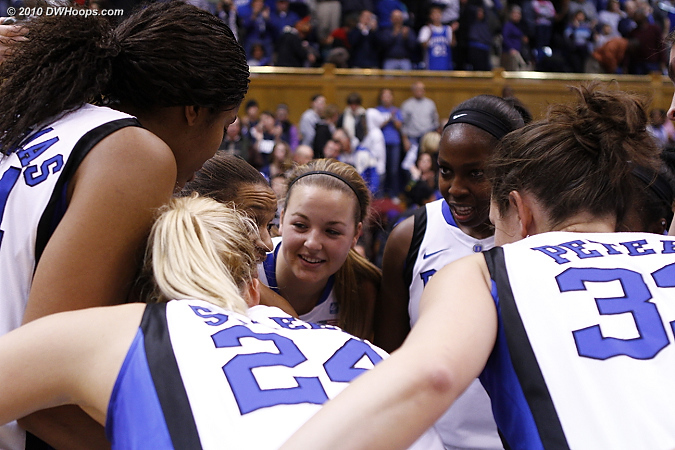 Jas and Shay in the Duke postgame huddle, perhaps more relieved than excited. 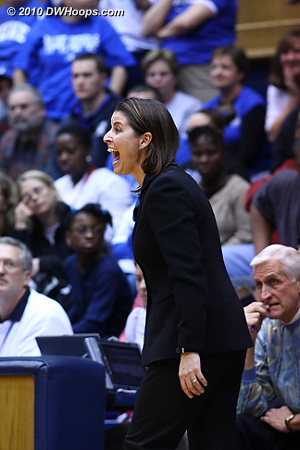 Coach P pleased with the outcome. 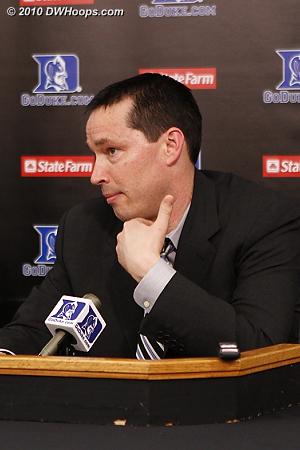 Xavier Coach Kevin McGuff in the media room, he took questions but understandably had no opening statement. 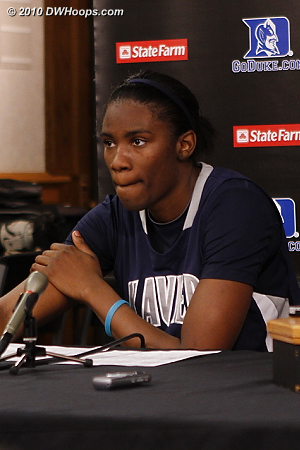 Amber Harris in the media room - it was a pleasure to watch her play, her offensive moves were second to none. 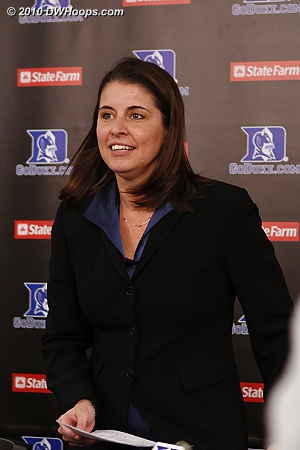 Coach P enters the media room.